Here is a simple demostration of the difference between the marginal distribution of a failure time and and the associated single-decrement function, in a competing risks framework with two causes of failure. 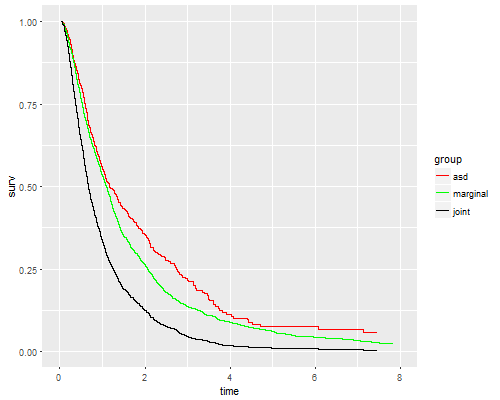 We will simulate two correlated standard log-normal random variables, with a user-supplied parameter rho. Call these t1 and t2. The overall survival time t is the miminum of the two. There is no censoring. 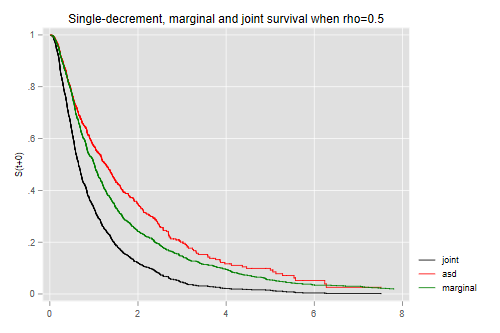 We calculate three Kaplan-Meier estimates: the joint survival, the marginal distribution of the (unobserved) time t1, and the survival-like function obtained by censoring observations that fail due to cause 2. What would you expect if the correlation is closer to zero? Closer to one? Try rho=0.2 and rho=0.8 to confirm your intuition.